BESONÍAS ALMEIDA arquitectos is an architecture office integrated by the Argentinian architects María Victoria Besonias and Guillermo de Almeida. 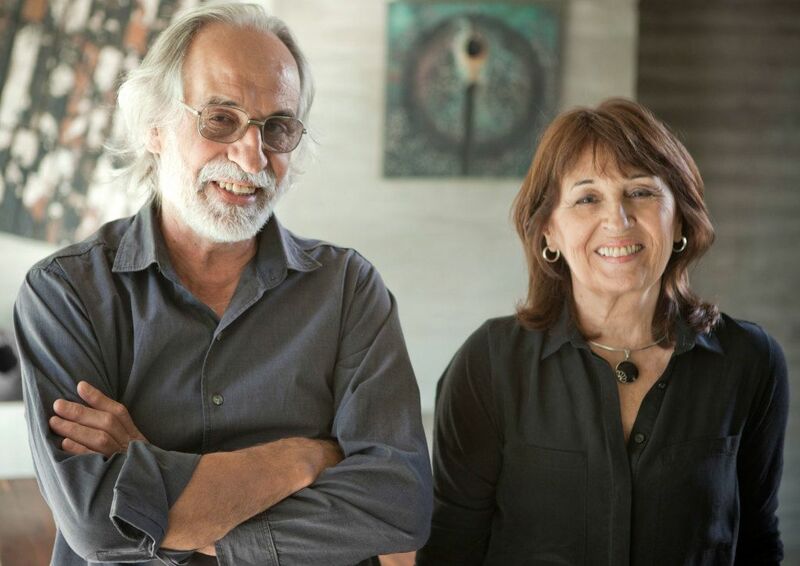 They both are engaged in the profession independently since 1975 and as holders of BAKarquitectos architecture office from 2000 until 2012. MARÍA VICTORIA BESONÍAS was born on October 18th, 1947 in Madrid, Spain. She earned a degree in Architecture and Urbanism from University of Buenos Aires in 1975, is a lecturer at FADU, the University of Buenos Aires and a member of the jury’s panel of FADEA (Federación Argentina de Entidades de Arquitectura). She serves as an advisor on urban issues and as a judge for architecture competitions. In 2012 has been honored by the Senators Chamber of the Province of Buenos Aires with the Trajectory and Merit Award. 2018- 6th International Meeting of Interior Design DArA ID, organized by DArA (Argentine Associated Interior Designers), CCK, City of Buenos Aires. 2018- College of Architects of the Province of Santa Fe (CAPSF), District 1. 2018 – “Un Día Una Arquitecta”, Department of Architecture, Design and Urbanism, National University of Avellaneda (UNDAV), Argentina. 2017 – CROSSINGS, Architecture and City Meetings – organized by Propuesta Decente and Un día/Una arquitecta, Estudio Aisenson, Buenos Aires City, Argentina. 2016 – Arquitectura Siete (A7) Meetings – “Architecture from a Gender Perspective”, organized by Arquitectura Siete (A7) at the FAU / UNLP, La Plata, Argentina. 2016 – Association of Architects of Junín, Buenos Aires Province, Argentina. 2016 – Annual International Congress of Architecture “Perspective – Consolidating Goals” organized by the Union of Students in Architecture, UEPA, jointly with the School of Architecture of the Autonomous University of Sinaloa, Culiacan, Mexico. 2015 – XXIV International Symposium “Crosscurrent- Architecture and Gender: Challenges in Today’s Society” Faculty of Architecture, University Autonomous University of Nuevo León. 2015- Lecture “To build protecting the unity of the territory”, III International Symposium Villa Gesell “Urbanismo de las Orillas” CAPBA Villa Gesell, IX District, Buenos Aires, Argentina. 2015- Lectures cycle, Azul’s Architects Association, CAPBA VIII District, Buenos Aires, Argentina. 2014 – Lectures Cycle: Thinking and Making at FAUD Auditorium (University Campus), National University of Córdoba, Córdoba, Argentina. 2014 – Program of Free Chairs (as assistant professor), Faculty of Architecture, Planning and Design, National University of Rosario, Argentina. 2013 – Argentinean Architecture Week in Manizales – Colombia National University. 2012 – XVIII Quito’s Panamerican Biennal of Architecture (BAQ), Seminar: The necessary architecture. Quito, Ecuador. 2012 – Architecture Lectures Cycle de la Facultad de Arquitectura de la U.P.B. de Medellín, Medellín, Colombia. 2012 – XXIV Latinoamerican Conference of Architecture Schools and Faculties (CLEFA), San José, Costa Rica. 2012 – International Conference L4titudes, Texas University, Austin, Texas, USA. 2010 – 2nd Architecure Meeting, organized by E. Posadas Group, Argentina. 2010 – Latinoamerican Architecture Lectures Cycle, Faculty of Architecture, Planning and Design, National University of Rosario, Argentina. 2009 – XIV Monterrey International Architecture Congress, Monterrey, México. 2009, 2008, 2006 – Lectures Cycle, Buenos Aires Province Architecture College, 3d District. 2008 – Lectures Cycle “Devolución”, Mendoza Architecture College. Argentina. 2008 – Lectures Cycle, Carlos Paz Architecture College. Córdoba, Argentina. 2007 – Lectures Cycle, Buenos Aires Architecture and Urbanism Professional Council. 2006 – Brasilia Biennal, Brasilia, Brazil. 2018- District Contest of Ideas New building of the Deliberative Council (elected as a jury by vote of the participants), Lincoln, Province of Buenos Aires. Organized by the College of Architects of the Province of Buenos Aires, CAPBA 6. 2018- National Contest of Ideas for the Master Plan of the Subfluvial Tunnel “Raúl Uranga-Carlos Sylvestre Begnis”. Organized by the College of Architects of the Province of Santa Fe, CAPSF District 1. 2018- National Competition “Carriage Square” (chosen by jury by vote of the participants), Campana, Buenos Aires Province. Organized by the Architects Association of the Province of Buenos Aires, CAPBA 5. 2017 – CAPBA Award 2017 – Built Architecture. Category: Multifamily Housing, organized by CAPBA Superior Council within the framework of the VIII International Biennial of Architecture and Urbanism (BIAU17). 2017 – FADU BIENNIAL Professional Prize Contest 2017, organized within the framework of the 2017 FADU Biennial. 2016 – Provincial Ideas Competition. Re-qualification and New Urban Image of H. Yrigoyen Avenue and surroundings/access door of the Municipality of Avellaneda, organized by CAPBA District II, named Jury by the participants. 2016 – Contest “Thinking about housing, living the city”, organized by FAUD, National University of Córdoba. 2015 – Provincial Preliminary Competition for the expansion and renovation of the annexes buildings to the Cathedral of Gualeguaychú and ideas for the immediate surroundings, jury designated by the participants. 2014 – CIMA Competition ( Puerto Madryn’s Industrial Chamber Building) – College of Architects of the Province of Chubut, jury designated by the participants. 2014 – ARQUIFADU Competition – Technological Center Design, Ciudad Evita, La Matanza. 2014 – Headquarters Association of Magistrates and Officers of the Trenque Lauquen Judicial Department Preliminary Competition. 2014 – Ideas Science Park National Competition. 2012 – Preliminary Competition for the construction of the new building of the Campana’s Public Library. 2011 – Berazategui Civic Square Draft. 2008 – Pedestrian Priority National Ideas Competition. 2007 – Architecture National Award SCA Clarín for Best Student Projects. 2006 – New Headquarters of the School of Psychology, UBA (Pavilion No. 5, University Campus) Winner Project. GUILLERMO DE ALMEIDA was born on November 12th, 1945 in Buenos Aires. He earned a degree in Architecture and Urbanism from the University of Buenos Aires in 1975. He taught architecture at the University of Buenos Aires and the University of Morón. He is a member of the College of Buenos Aires High Council of Architecture and their jury’s panel. Guillermo was a guest lecturer at Brasilia’s 2006 biennial. He participated in the 2007 CPAU young lecturers’ series, the 2008 Architects’ College of Carlos Paz Conference and the 2008 Commune of Cabalango Conference. He was also a guest at the 2008 Devolution Conference, organized by The Architects’ College of Mendoza. Collaborate or have collaborated with the studio since 2000: Arch. Diorella Fortunati, Arch. Florencia Testa, Denisse Gerard, Arch. Micaela Salibe, Karina Casares, Hernán de Almeida, Ekaterina Allaria, Belén Ferrand, Federico Santinón, Enzo Vitali, Arch. Leandro Pomies, Andrea Wohlgenannt, Arch. Diego Grosso, Martin Saavedra, Alejandro Sánchez, Sebastian Sciccioli.